Periodontal disease, also known as gum disease, is not one disease, but a whole host of different forms of disease. 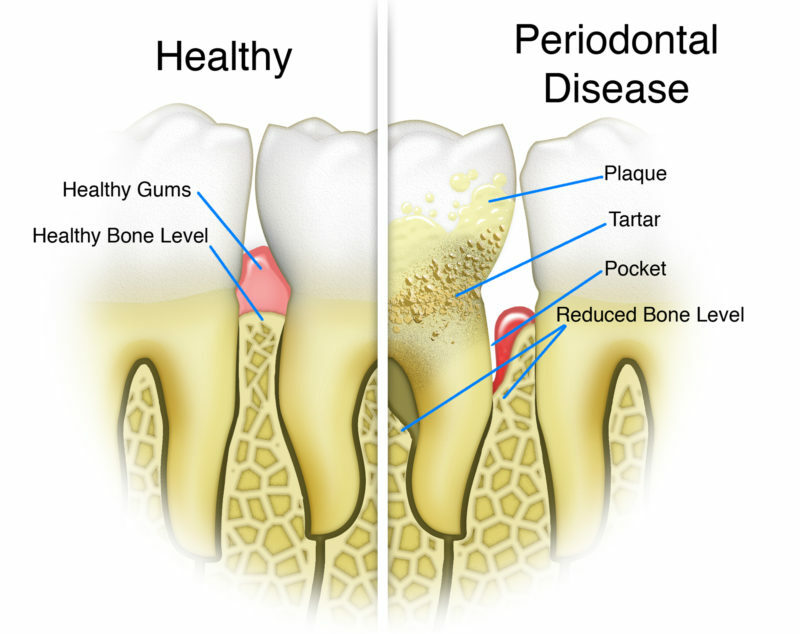 Periodontal disease is caused by bacteria in the plaque that accumulates on the teeth and around the gums. In most cases, it can be treated or managed, but it’s always important to take preventative measures. The most common form of periodontal disease is gingivitis. Gingivitis is an inflammation of the gum tissue around the teeth. It occurs when there is too much plaque buildup along the gum line. It is pretty easy to spot: bad breath, red, swollen gums, followed by bleeding gums when brushing. In some cases gingivitis may be a symptom of a bigger issue, for example, hormone changes like those that take place during puberty and pregnancy can increase the chances of developing gingivitis and worsen any existing symptoms. While teenagers and pregnant women should be especially vigilant, everyone should maintain a healthy oral hygiene routine to prevent gingivitis. Make sure you visit your dentist for your regular check ups and cleanings every six months. Invest in a soft toothbrush or electric toothbrush and brush twice a day. Additionally, flossing on a regular basis and using mouthwashes at the direction of your dentist can also help beat back gingivitis. Your dentist may also be able to recommend toothpastes that are designed to strengthen your gums and reduce your chances of periodontal disease. Periodontitis is the second-most common periodontal disease. However, unlike gingivitis, it is considered more serious and can have serious, damaging effects. Periodontitis occurs when gingivitis is left untreated and can result in bone loss around the teeth and under the gums. Periodontitis can be prevented and treated, but any damage is, in most cases, irreversible. The signs and symptoms are the same as those for gingivitis, bleeding gums and inflammation. In addition gum pockets, space between the teeth and gums, will begin to form. Bacteria floods these spaces, allowing plaque to form below the gum tissue, which eventually leads to bone loss. Smokers, people suffering from diabetes or obesity, and patients who generally have poor oral hygiene are at a higher risk of developing periodontitis. Unfortunately, periodontitis can lead to further health issues and complications if left untreated. In the treatment of periodontitis, it is important to remember that it can’t be completely cured. For periodontitis it is a matter of prevention and, if you do develop it, management. In order to avoid periodontitis, we recommend that smokers quit smoking. We encourage using a sensitive toothbrush and regular cleanings. If you suffer from periodontitis, you will need to undergo deep cleanings, such as scaling and root planting, which will help control the disease. In severe cases, gum surgery may be required. If you suspect you have gingivitis or periodontitis, make an appointment to see your dentist as soon as possible. When it comes to your gums, catching the disease early can save you a lot of pain, trouble, and money.